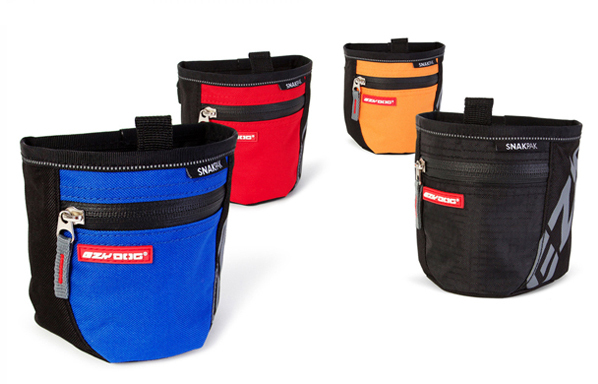 The EzyDog SnakPak is a treat bag with a magnetic closure and it clips around your waist for convenience. The magnetic opening system provides a simple and rapid access to our dog's favourite treats during training sessions. For the fashion-conscious the SnakPak is small enough to be inconspicuous so you may decide to wear it also during your daily walks as we have started doing. With an overall volume of 650ml, there is plenty of space not only to carry dog treats but also all other dog walking essentials: dog waste bags, keys, smartphone etc. A magnetic closure provides a fast and simple access to rewards during training. No more treat spillage when you bend to pick up the ball during a game of fetch! 2 methods to attach the SnakPak treat pouch: you can use the twin belt hooks located at the rear of the pack. This will stabilise the bag around your waist or you can use the adjustable webbing waist strap. Internal pull-up liner for a wipe clean. You can basically turn the inside of your treat bag out and wipe it with a damp cloth and leave to air dry. The front zip pocket is waterproof. There is also a little clip inside to attach your keys for extra safety if you decide to grab another item out of the pocket. A range of funky colours to choose from: Blue, Black, Orange and our favourite Red! The high-quality we’ve come to expect from this brand and this item did not disappoint.